Hydroponics is the growing of plants without using soil. Instead, plants are grown in an inert medium and fed a nutrient solution which includes all the elements necessary for plant growth. Hydroponics make it possible to grow plants in locations where it would not normally be possible, i.e. poor soil, rocky area, balconies etc. With the use of artificial lighting it is even possible to successfully garden in a spare room, garage or cellar. The secret of obtaining consistently good results from hydroponics is to provide the best possible nutrient solution. The ETI range of hydroponic instruments are designed to help ensure plants are grown in the best possible conditions. One method of checking the strength of a nutrient solution is to measure how well it conducts electricity. Although absolutely pure water is not a conductor, the flow of electricity increases proportionally as salts are added. Measuring electrical conductivity (EC) is a direct indication of the nutrient level in a solution. A conductivity factor (CF) meter determines conductivity by measuring the amount of electricity that passes between two electrodes placed in the solution. 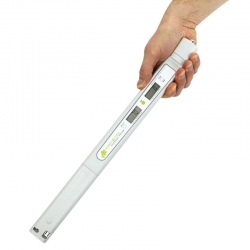 CF meters, designed for use with hydroponic systems, usually have a scale of 0 to 100 CF units. Nutrient levels are also often expressed in parts per million (ppm), so it is helpful to know that 65 ppm is equivalent to one CF unit (10 CF units are equal to 1000 μS). Most people are familiar with pH (potential hydrogen) as an indicator of how acidic or alkaline a solution is. 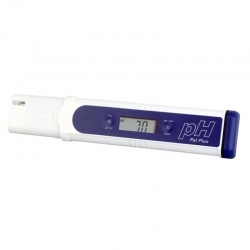 The pH scale ranges from 0 pH (very acidic) to 14 pH (highly alkaline). Pure water, at 7 pH, is neutral. 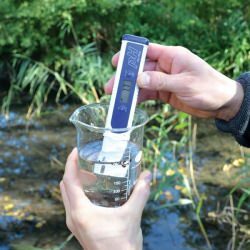 Maintaining the correct level of pH is critical, both in soil or hydroponically. Plants absorb each nutrient element only within a certain pH range and, because this range is different for different nutrients, there is only a relatively small pH range in which all nutrients are available. Plants can generally survive within a pH of 5 to 7.5, below 5 there is a danger of burning and destroying the sensitive root tissues, whilst at pH levels of 7 and above, some nutrients may precipitate out of solution and become unavailable to the plants. The optimum level is about 6.4 to 6.5 pH, with anything in the range of 6 to 7 pH being acceptable. 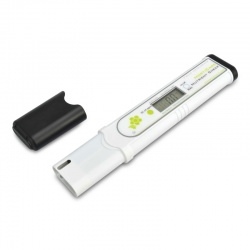 Unless an automated controller is being used, the pH level should be manually tested and corrected daily.